Apple gives you 5GB of iCloud storage space for free, but that can feel cramped rather quickly if you have more than one iOS device to back up. Here’s how to make the most of the space you have. When Apple introduced iCloud in 2011, it announced that every customer with an Apple ID would receive 5GB of iCloud storage space for free. You can add more storage: 50GB ($1 per month; 200GB ($3 per month); 1TB ($10 per month); or 2TB ($20 per month). But if you’re not interested in ponying up extra cash for iCloud storage, that 5GB can quickly get tight. That’s especially true if you use your iCloud storage allotment to back up your iOS devices. You may find that you’re unable to back up both an iPad and iPhone to iCloud, because you don’t have enough room. Does that mean you need to either pay for more storage or revert to old-fashioned iTunes backups? Not necessarily. Instead, it means you need to exercise a little extra manual control over how you send items—and more specifically, what you send—to iCloud for safekeeping. To start, open the Settings app on one of your iOS devices, and then tap iCloud. Now tap Storage. 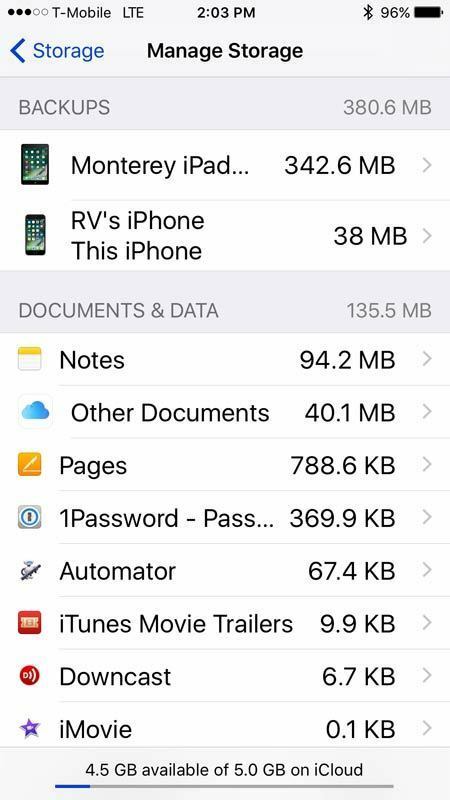 On the screen that appears, you’ll see the total amount of storage space you have on iCloud (5GB, if you haven’t upgraded), along with the amount of space that’s available. Beneath that is a Manage Storage button. Tap it. At the top of the subsequent Manage Storage screen, you’ll see a list of all the iOS devices that you’re backing up to iCloud, including the current device. Examine the list closely. If it claims that you’re still backing up, say, the old iPhone 3GS that you haven’t used since before House was cancelled, you’ll want to delete its backup so that it stops gobbling up your precious storage space. Tap the unneeded device’s name, and then tap the Delete Backup button that appears. If you instead tap the name of the device you’re currently using, you reach a screen offering fine control over the precise items you’re backing up for that device. 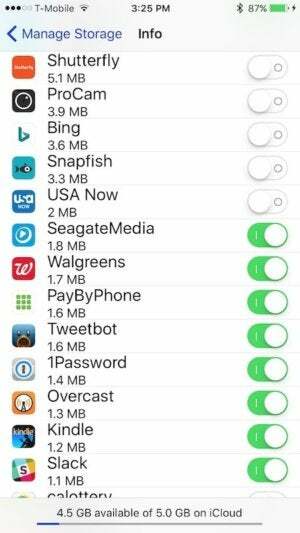 You can turn off backups for those apps you don’t use much at all but like to have on your device. On that screen, you’ll see the current size of your device’s backup, along with an estimate of how large your next backup will be. Below that, you’ll see a list of apps that can back up their data to iCloud. 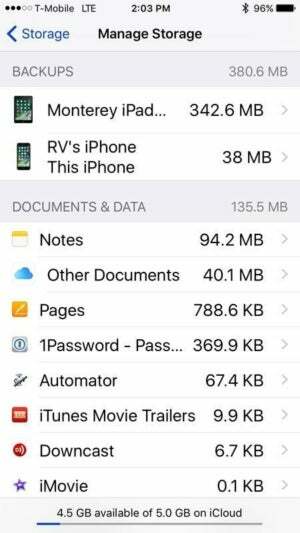 With one exception, the list appears in descending order according to the amount of space each app requires to back up its data in iCloud. The one exception: Photo Library is always first. It isn’t always the biggest item on the list, but it often is. 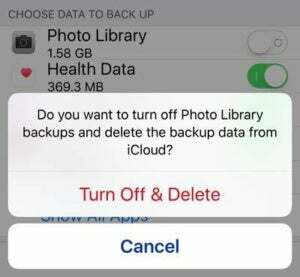 Tapping to turn off the Photo Library brings up an intimidating question: ‘Do you want to turn off Photo Library backups and delete the backup data from iCloud?’ You can choose Turn Off & Delete or Cancel. That first option is scary. If you think it means you’ll lose your precious photos and videos, don’t worry: You won’t—or, rather, you probably won’t. By default, iCloud backs up your iOS devices’ Photo Library. That way, if your iPhone croaks, chokes, or otherwise gives up the ghost, you can restore from iCloud and get all your photos and videos back. If you do tap Turn Off & Delete, then, you aren’t deleting those visual memories from your device; rather, you’re simply freeing up the iCloud backup space they consume, and removing the ability to restore those photos from iCloud should disaster strike your iOS device. That isn’t necessarily as risky a move as it sounds. Whenever you connect your iOS device to your Mac, you can back up its saved photos and videos to iPhoto. But even if you rarely—or never—sync your iOS devices over USB, you probably don’t need iCloud to back up your photos, thanks to Photo Stream, which keeps up to 1,000 of the last photos you snapped over the past 30 days. Merely turning off the Photo Library backup will shave off a significant chunk of your iOS devices’ backups. That may be enough to allow you to back up all of your iOS devices without busting the 5GB cap. But you can do even more. Depending on how you use your iOS device, you likely will want to continue allowing some apps to back up their data to iCloud. If you frequently create documents in an iOS text editor, create songs in GarageBand, or generate any content at all, and you don’t regularly back it up (or export it in some other fashion), you should use iCloud backup for those apps. But you probably don’t need to use iCloud to back up data from many other apps you use. And even if most of those apps account for only a few megabytes per backup per app, they can add up to a significant chunk of storage. For example, you might disable iBooks’ iCloud backup, since you can always restore your iBooks purchases from directly within the iBookstore. You probably don’t need to back up whatever data is stored by games for your kids, or games for yourself in which you don’t care about in-game progress or customizations that you might have made. And for apps that sync and back up their data on the web—such as Instapaper—backup might be unnecessary, too. Careful, though: Don’t turn things off willy-nilly. For example, you might think, “Hey, I don’t need to back up my data from the Cards app!” And you may well be right. But if you were to learn that, after an iCloud restore, your old photo cards were now but a memory, you’d be crushed. At long last, let’s back up one level from that device-specific screen in iCloud’s settings. (Remember, though, to configure the settings for Photo Library and other apps on each iOS device you back up.) 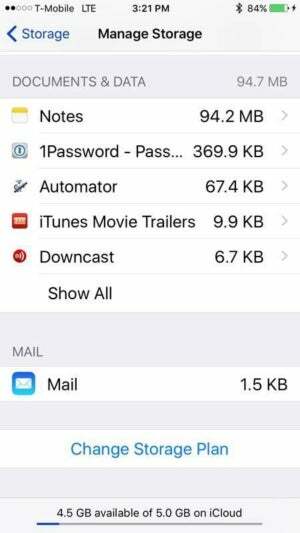 On the main Manage Storage screen, past the list of your devices, you’ll see two other sections: Documents & Data, and Mail. The Documents & Data section refers not to the kind of content iCloud should back up, exactly. Instead it refers to all those bits of data that iCloud syncs between your iOS devices (and, in some cases, your computer). 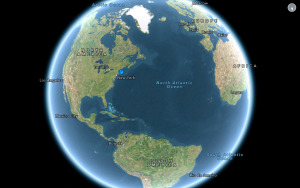 This data counts against your iCloud storage allotment. Interestingly enough, this section of iCloud’s settings can even refer to data that you saved only on your Mac. In my case, it revealed several megabytes’ worth of content I’d saved in Preview while exploring; deleting those old, unneeded documents freed up a little extra iCloud space. In addition, this section lists synced data from iCloud-leveraging apps and games. On my iPhone, that list includes Pages, Passbook, Keynote, and The Incident. I want my progress in The Incident synced between devices, and the sync data consumes just a single kilobyte, so it survives the cut. But if, for example, you see that Pages is taking up many megs (or more), you can tap it to get a listing of each document saved there, along with the amount of space it’s taking up. If you notice files you no longer need, clean ’em out. If you use iCloud as your primary email account, you may have your work cut out for you. All that mail counts against your iCloud quota. If you don’t regularly archive email offline, prune attachments, and delete what’s deletable, Mail may gobble up an increasingly large percentage of your iCloud quota. I don’t use iCloud Mail, but I found that it was—at first—claiming about 20MB of storage space. I logged in to iCloud.com and cleared out my initial welcome message and a few other test messages to whittle that number down, though it never hit zero. If you use macOS Sierra, you’ll find a few features that rely on iCloud storage. Go to System Preferences > iCloud, and in the main window, you’ll see a list of checkboxes. The first one is iCloud Drive and if it’s checked, that means your Mac is using iCloud storage. If you don’t want to use iCloud Drive, uncheck this box. You will see a warning that says the files in iCloud Drive will be removed. To save these files, click on Keep a Copy. Your files will be saved to a folder called iCloud Drive (Archive), which will be located in your Home folder. 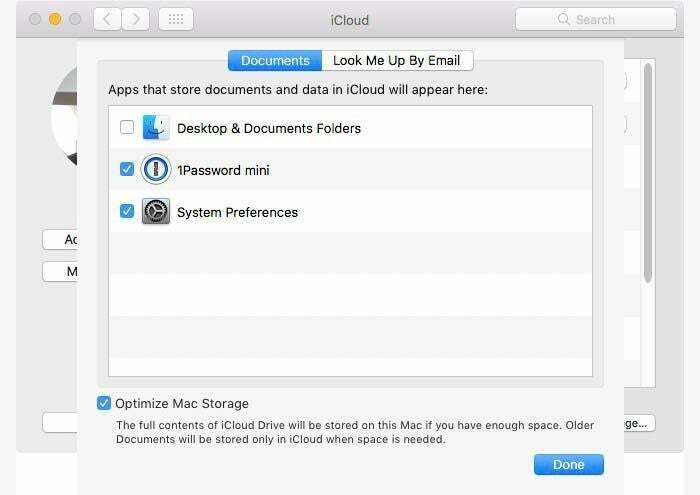 If you do want to use iCloud Drive on your Mac, you can fine-tune it. Check the iCloud Drive box, and then click the Options button. Apps that save to iCloud Drive will appear, and you can select the ones you want (see below). Another way to manage your Mac’s use of iCloud Drive is through macOS Sierra’s Optimize Storage feature. Here are the details on Optimized Storage and its settings. Combine these tricks—disable Photo Library backups, curate which apps get to back up their data to iCloud, limit what types of data you sync with iCloud, prune unneeded iCloud mail, and check you Mac’s iCloud Drive usage—and you can dramatically shrink the space required to back up your devices with iCloud. But if you just can’t trim enough iCloud-stored data to fit everything you need, Apple is always happy to let you pay for more space, and you can buy more space directly on your iOS device in the Settings app (iCloud > Storage > Buy More Storage). Editor’s note: This article originally published on October 3, 2012. It has been updated to reflect the settings in iOS 10.2.1 and macOS Sierra.